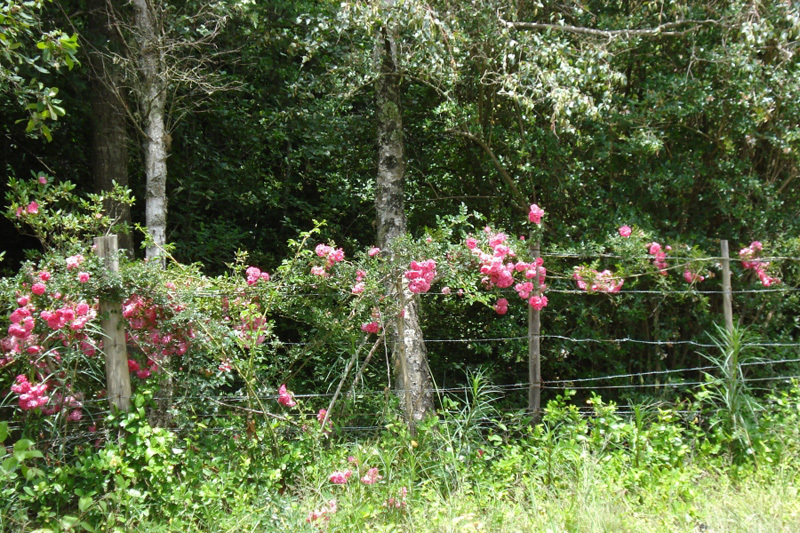 Hi, I’m Ingrid from Granny Mouse House Guesthouse and self-catering Cottages in Hogsback in the Eastern Cape. 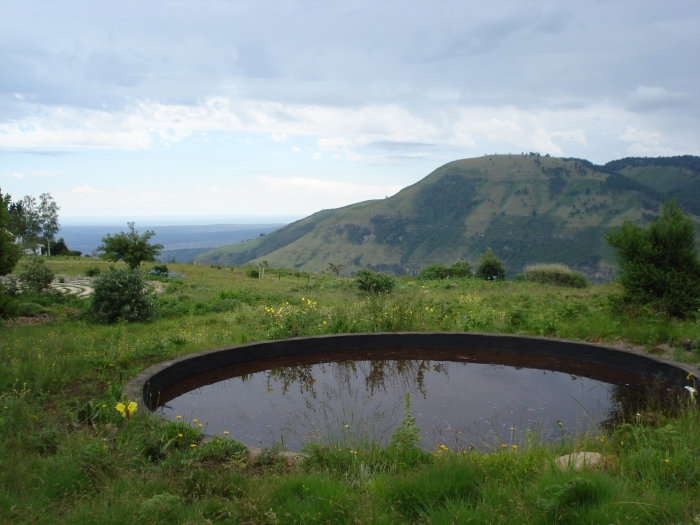 HOGSBACK IS BEST KNOWN FOR for its high altitude, 27 awesome waterfalls, mountain views, walks and hikes, clean air, indigenous forests, artistic community and affordable, friendly hospitality. GET YOUR PICTURE TAKEN AT The Arboretum (Collection of rare trees in a woodland Park setting) because it is beautifully landscaped, has an easily accessible waterfall as a back-drop and commands views of the 3 Hogs mountains). THE BEST SNOW PICTURES CAN BE TAKEN AT Kettlespout waterfall, which overlooks the valley below and mountains opposite. WHEN THE WEATHER’S GOOD IN LIKE TO be working in my gardens, which are open for viewing by the general Public 9 months of the year (Closed 15 May-15 August). WHEN THE WEATHER’S BAD I LIKE TO rest indoors beside a crackling fire sipping sherry, or curl up with a good book, or write, or have friends over for a meal. I THINK THE BEST TIME TO VISIT IS May, because the Autumn display of colouring leaves is quite spectacular, the weather has usually cooled a little, the weather is mild and clear, which lends itself to invigorating walking in the fresh mountain air. MY FAVOURITE BREAKFAST SPOT IS The Edge restaurant. FOR LUNCH I SUGGEST The Enchanted Treehouse. MY FAVOURITE RESTAURANT IS Nutwoods Park, but do phone a few days ahead, they operate by appointment only. MY FAVOURITE SUNDOWNER SPOT IS The Microwave Tower look-out Point. FOR A NIGHT OUT ON THE TOWN TRY Away with the Fairies backpackers Pub. IF YOU WANT TO MEET LOCALS, GO TO The Hogsback Inn Pub. HOGBACK’S BEST KEPT SECRET IS that it feels like being in another Country. 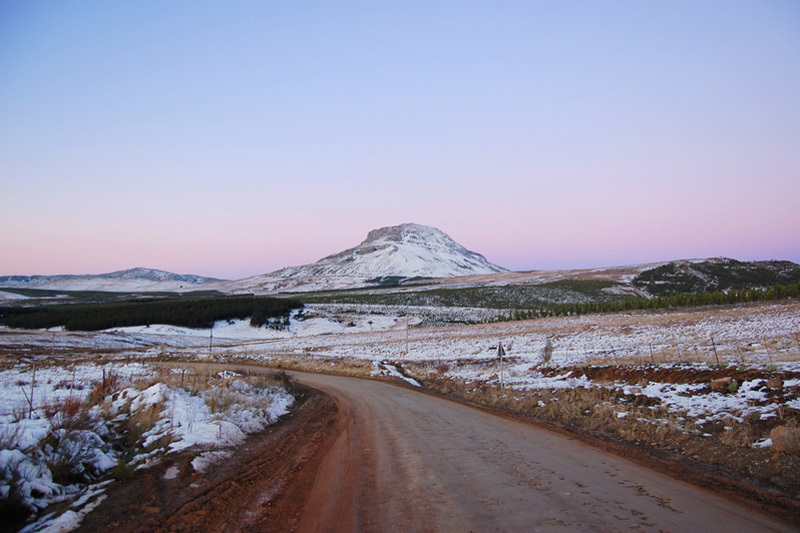 A settler village perched high up in the mountains, with its own “English climate” and woodland atmosphere, which comes as a surprise as one ascends the Pass, after driving through arid scrub-land and Xhosa Villages dotted around the flatlands leading to it. MY FAVOURITE THING TO DO WITH FRIENDS IS to have a braai and discuss local issues! FOR SOME CULTURE I LIKE TO GO TO The Rose at Starways, which periodically features song and dance or opera. TO RELAX AND RESTORE MY SOUL, I LIKE TO walk with my two beautiful Rhodesian ridgebacks in the mountains. IF YOU’RE FEELING ADVENTUROUS, TRY Abseiling at Hobbiton or drive the 55km 4X4 Trail (in a suitable vehicle)! 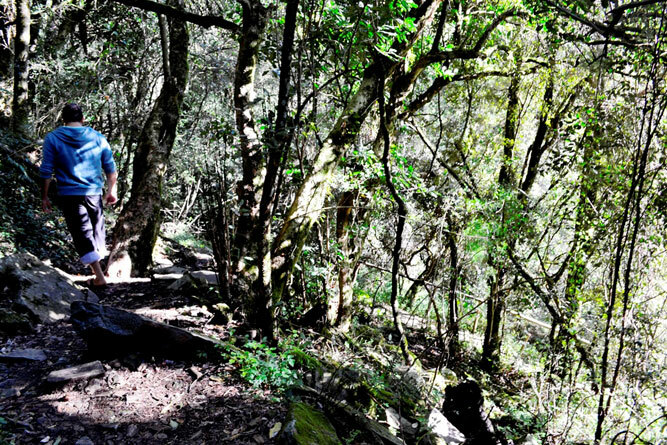 MY FAVOURITE HIKE IS The 3 Waterfalls hike, on the way to keiskammahoek. MY FAVOURITE KNICK-KNACK SHOP IS The Hoggest shop adjoining The Happy Hogs Restaurant. MY FAVOURITE BIRD WATCHING SPOT IS my own garden. IF YOU’RE HERE IN If July, join in the fun at the Annual Xmas in July weekend. (weekend closest to 25th). MY FAVOURITE GALLERY IS The African Art collection at Fort Hare University in Alice. MY FAVOURITE BUILDING IS The Arminel Hotel, for its beautifully restored thatched facade and tasteful decor. TRAVELLING WITH CHILDREN? 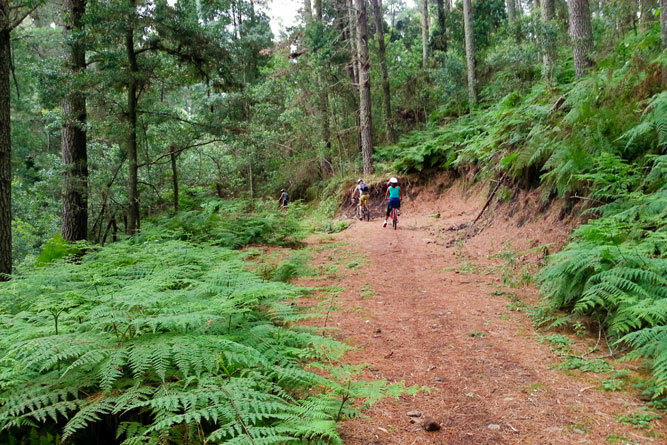 A FUN OUTING IS Hobbiton on Hogsback or horse-riding at Lowestoffe. BEST CHEAP AND CHEERFUL OUTING IS a stroll through the Village or a drive around the Arts and Crafts Trail. THE MOST UNUSUAL THING I SEE HERE IS the rare and endangered Cape Parrots, and the rare shrubs and trees to be found in private gardens, most of which admit the Public for viewing in October. MY FAVOURITE WEEKEND GETAWAY IS … still to be discovered! WHEN I WANT TO GIVE BACK TO THE COMMUNITY, I serve on various committees, run a free domestic-animal tracking system to recover lost local pets, raise funds for animal rights groups and charities through the sale of my book “ How to live in a pack, when you’re a human” published in 2007 (sale price R70 per copy , orders to ingi@iafrica.com) or viewing of my gardens at R5 per head. Striving for service excellence in my own 4 star rated accommodation establishment also reflects well on the rest of the Community and leaves visitors with wonderful memories of their visit to Hogsback. 1). Snowfalls have been recorded in every month of the year, except February. 3). Before embarking on hikes of any duration, it is advisable to inform someone of your intended route and expected return time. 5). Leave only footprints, take only photographs. It is illegal to remove anything other than wattle and bugweed from Indigenous forests. 6). Remember that others visiting and those living in the area do so to commune with nature and enjoy the peace, please do nothing to disturb that (in particular, please do not bring your quad-bikes – but your mountain bikes are welcome everywhere). 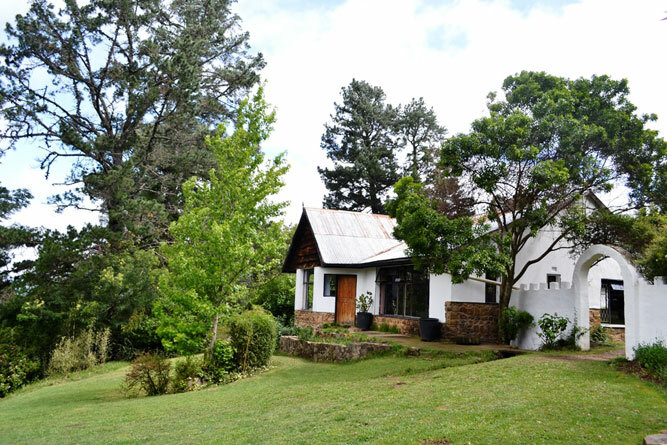 I LOVE HOGSBACK BECAUSE I feel privileged to live peacefully in a pristine environment surrounded by magnificent natural beauty and love to share the peace and tranquillity with clients. I just love this camp its one of the best in sa I came 7 times and it was amazing the bond that I had with other children was fantastic the last day I left hobbiton it was very emotional and touching this I would like to go again nad have expierence adventure December I am waiting I belong to hobbiton . Hogsback is my ‘soul-space’. It holds a long history for me, dating back to the late 60’s – early 70’s, when as a disadvantaged and broken child, I spent many amazing and soul-inspiring school holidays at the Hobbiton-on-Hogsback childrens camp, then run by the Bowden’s. I formed a life-long affinity with the “3 Hoggs”n which we called the “3 Sisters” back then. I cannot explain to anyone how one can love a place…or a mountain…with such an intensity that the longing for them is like a physical pain. Luncheon, I spent the week-end there…and most of the time in tears, as my heart over-flowed with the joy of returning and seeing my beloved mountains and forsests again. I returned again in June for a 7 day stay and had such an emotional revisit to Hobbiton with my sister…as we recaptured a part of our childhood. I stripped and ran naked through the forest and had a very emotional ‘ceremony’ of setting my child-spirit free, to forever fly freely in wild abandon through the forest and over my mountains. Just today I had another emotional ‘breakdown’ as my dear childhood friend, Judy Bowden, whose parents, Peter and Edna Bowden ran Habbiton back in the day, e-mailed old photo’s of the ‘old’ days to me, to use in my memoirs which I am busy writing, to better explain my intense and total love for ‘my’ mountain village and it’s healing and magical beauty! I remember every nuance…every hike…every moment of my childhood days there so vividly, that when I close my eyes, I’m present in that time. 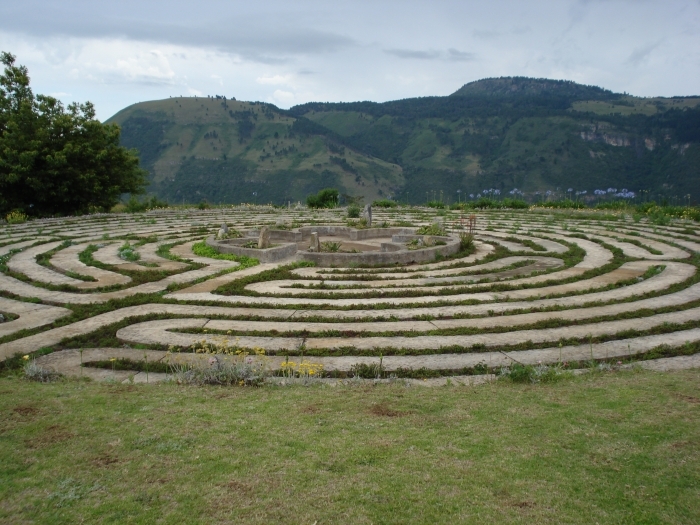 Hogsback…my soul healer…my sanity…my sanctity. 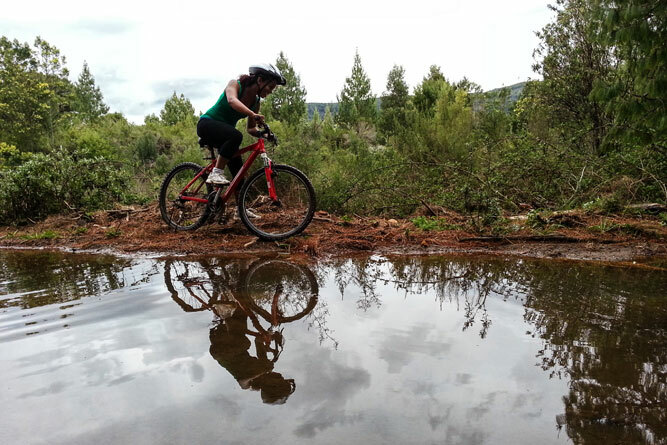 Hogsback…my reality of fantasy! Would love to visit sometime.